My very own green goddesses. I love going out to my garden and picking fresh cilantro for guacamole or basil for homemade pizza sauce. 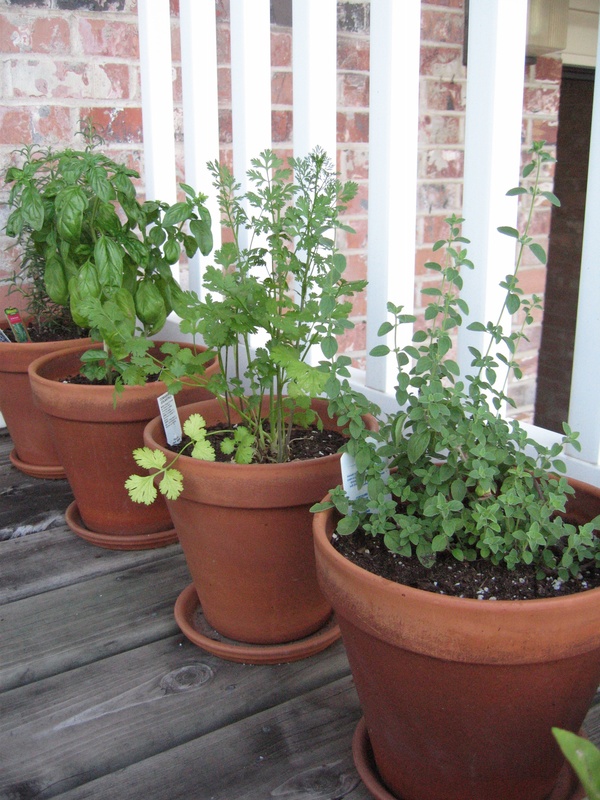 Wouldn’t it be wonderful to have fresh herbs all year long to dress up your favorite dish? Here are some tips for year round herbs that trump grocery store dried varieties any day of the week. Indoor Garden. Many herbs like oregano, marjoram, chives, basil, cilantro, thyme, mint, rosemary and lavender do wonderful indoors if started from seed or a starter plant. Invest in good potting soil and a nice clay pot (plastic doesn’t work well). Keep these green beauties trimmed, well watered and cozy in bright direct light and warm temps above 60°. If you are looking at bringing the outdoors in, it is best to transplant your herbs in September before the first frost hits. Cilantro and basil do not work well as transplant herbs, but the others do just fine. Again, place them in clay pots with good potting soil and slowly acclimate them to lower light levels before moving them indoors for good. Dry Out. My dad dried basil last winter and it worked beautifully! All you need is some string and brown paper bags. First, clean and pat dry the herbs keeping leaves on the stems. Once herbs are dry, tie the stems together, place them in a paper bag and hang them upside down to dry for 4-6 weeks. Pick the dried leaves off the stem and place them in a tightly sealed container. Do not crush the leaves until you are ready to use them in your recipe. Crushing them will release their aromatic oils which adds all of the flavor and aroma to your tasty dishes. Freeze In Fat. Freezing your herbs in a fat such as olive oil helps preserve the lovely oils that add so much flavor to your wintry stews. For this method, you’ll want to pick the leaves off the stems, wash and dry them in a salad spinner or pat dry with a paper towel. Place the leaves in a food processor with olive oil (1/3 cup olive oil for every 2 cups of leaves). Process the herbs until they are finely chopped and place 1 cup of the herb-oil mixture into a 1-quart zip-top bag and lay the bag flat in the freezer so the mixture will freeze in a nice, even layer. Use within 6 months by cutting off as much of the herb oil you need for pestos, soups, stews, salad dressings, hummus and more. Use Ezekiel sprouted bread and wraps or Julian’s Bakery coconut bread and wraps for gluten-free kids. You can even use cookie cutters for fun sandwich shapes. 1. BLT: nitrate-free bacon, tomatoes, lettuce (romaine, kale, arugula, spinach), guacamole. 2. Southwest: add taco seasoned chicken, turkey or grass-fed beef, tomatoes, bell peppers, lettuce (romaine, kale, arugula or spinach) avocado, black olives. 7. Standard: Applegate Farms nitrate-free roast beef, provolone cheese, tomatoes and lettuce (romaine, kale, arugula or spinach). Make this the night before or on the weekend and refrigerate (or freeze if needed). Again, let the kids have fun and pick out their own toppings. 1. Spread high quality pizza sauce (or make your own) on wrap. 2. Add meat: Applegate Farms nitrate-free pepperoni, ground turkey or grass-fed beef or shredded chicken. 3. Add additional toppings: olives, roasted or sautéed veggies, pineapple, cheese, etc. 4. Bake in oven on 325° until cheese is melted and wrap is crisp. Take skewers and add leftover roasted chicken or chopped steak, cheese, veggies and fruit. Again, cookie cutters are fun here too! Their growing bodies need plenty of fiber, vitamins and minerals. Toss in some raw veggie sticks with guacamole or hummus dip, fresh fruit, greek salad, celery with nut butter or any other veggies they like. 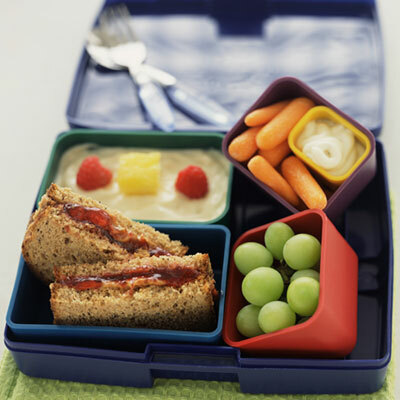 Sometimes it is fun to throw in a little treat now and then, especially if they are wanting cookies or candy bars like their friends have in their lunches. Try making your own trail mix with nuts and dehydrated fruit, date and walnut brownies or 1/3 of a Larabar. ***While nitrate-free deli meat is easy when you’re in a pinch, still keep it in moderation and try not to feed it to your kiddos more than once per week.